These ICA pertain to the inertia reel shoulder harness system installed in the 2 forward seating positions. The shoulder harness system consists of an inertia reel mounted to the aircraft cabin roof above and behind each seat, a "Y" shaped shoulder harness, a lap belt with mating buckle and associated bracketry and hardware to attach the system to the aircraft. See Owner's Manual Supplement, Report 1302, for proper placement of harness. There is no regular servicing required for the shoulder harness system beyond normal cleaning. Refer to AmSafe website (www.amsafeaviation.com) for cleaning instructions. There is no regular servicing of the attachment hardware required. Maintenance of the inertia reel and harness is limited to cleaning. The attachment hardware and bracketry should be inspected as part of the annual inspection of the aircraft for deformation or cracking of the bracketry and that the hardware is secure (see AC 43.13-1B, 9-8-98, Paragraph 5-15). Check the attachment bracketry and hardware for corrosion per AC 43.13-1B, 9-8-98, Chapter 6. Any bent, broken, damaged or corroded parts must be replaced. Refer to BAS Installation Instructions, used during the original installation, for removal and replacement information on the inertia reel. These should be included as part of the maintenance records of the aircraft, but may also be obtained from BAS, Inc. If the reel is removed, ensure that all of the components, such as the tension strap (when installed), are properly reattached upon reinstallation of the reel. The inertia reel and attachment hardware and bracketry should be inspected for proper operation during annual inspection of the aircraft. The reel should allow for extension of the harness during a slow pull, but should lock up during a quick pull of the harness. Failure of the reel to function properly in either of these conditions is cause for removal and return to AmSafe for repair or replacement. The shoulder harness does not have a fixed overhaul period, but should be inspected and replaced on condition. Refer to AmSafe website for removal and replacement information on the shoulder harness system. There are no limitations on the operation of the aircraft due to the installation of the shoulder harness system. This Airworthiness Limitations section is FAA approved and specifies maintenance required under Secs. 43.16 and 91.403 of the Federal Aviation Regulations unless an alternative program has been FAA approved. These Instructions for Continued Airworthiness have been reviewed and accepted by the FAA. 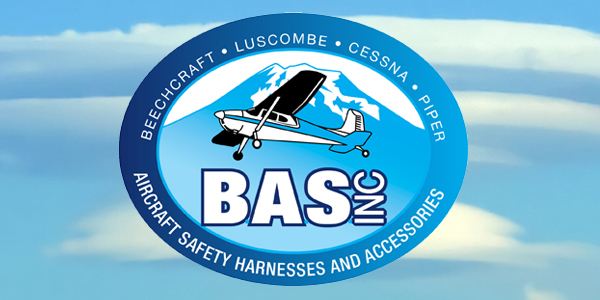 In the event a revision is required, BAS, Inc. will submit the revision to the FAA for review and approval. The revised ICA will be mailed to the owner of record of each modified aircraft. The revised ICA will also be posted on the BAS website. The revised ICA must become a part of the aircraft records and a logbook entry made noting the revision. if the AmSafe website is unavailable, please contact BAS, Inc.
All contents of this site are copyright B.A.S. Inc. 2014 and may not be reproduced without written consent.